Another book that came in the Modern Comics 3-Packs that I bought that day at Two Guys was this issue of E-MAN, reprinted from the earlier Charlton printing. Like many of the Charlton covers of this era, it had a painted cover, this one by he series artist Joe Staton. I wasn’t a big fan of painted covers at this point–they seemed wrong to me somehow, like trying to pass off the super hero goodness within as something else, something more respectable. Also, the reproduction on the Modern Comics printing was notably washed out, at least on my copy. 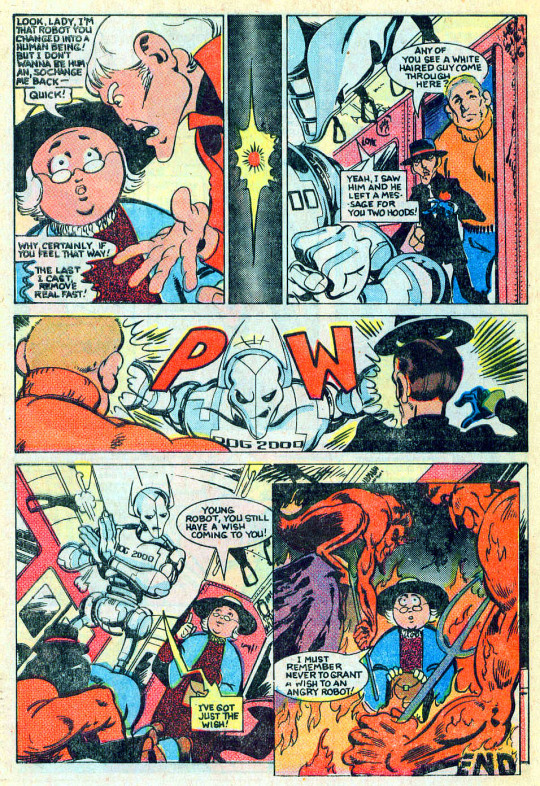 E-Man was a fun and bouncy super hero strip created by Charlton writer-editor Nick Cuti and illustrator Joe Staton. In a time in which most other super hero stories were striving to address relevant social issue and deep philosophical and metaphysical questions, E-Man was a deliberate turn back towards charm and fun, in the tradition of Jack Cole’s Plastic Man,. The lead character, E-Man, was an energy being, born when a star exploded, who took on physical form and used his amazing energy-to-matter powers to fight injustice and other stuff. By this point, E-Man’exotic dancer human friend Nova had been transformed into an energy being herself, with identical abilities. Other members of the cast included Teddy Q, a koala bear, and Michael Mauser, a shabby private investigator. E-Man was a series that never took itself too seriously. 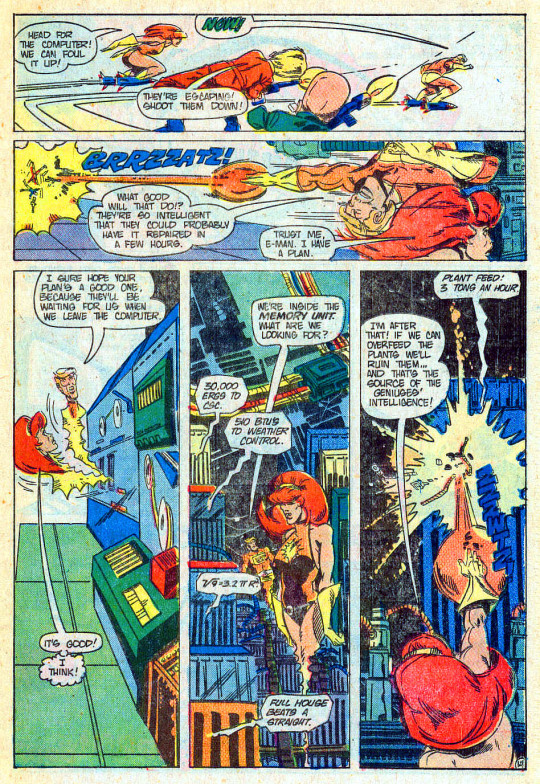 Staton at this point was just beginning his career as a professional comic book artist–he’d later go on to do a long run at DC, primarily on Green Lantern. This particular E-Man adventure opens with Nova going to interview a local Professor, who laments the loss of the plants he’s been developing. Before Nova’s eyes, the Professor loses his great intellect, becoming sub-literate–before some flying widgets burst into his office and shoot him dead. This is all connected to a case that Mauser is working involving other dead scientists and the shadowy Genius One who appears to have assassinated them as part of a campaign to take over the world. 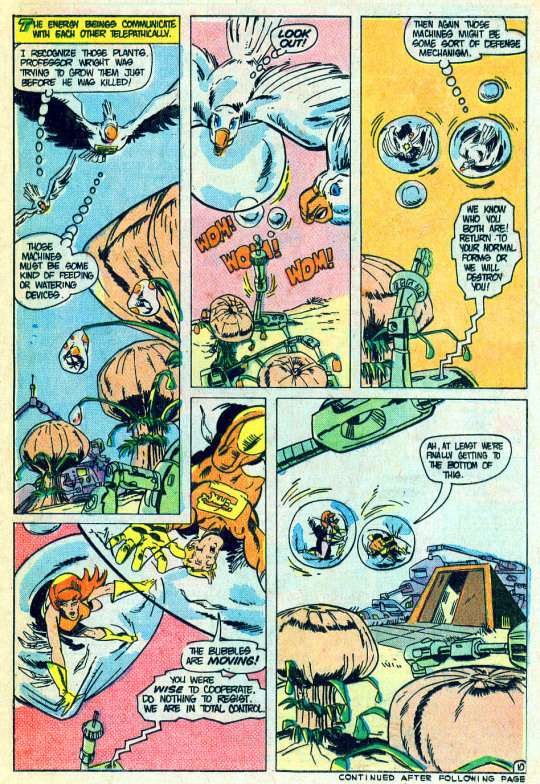 Mauser’s patron, General Dove, conscripts E-Man and Nova to infiltrate Genius One’s island base–which they attempt to do in the forms of first dolphins and then birds. But E-Man and Nova are detected and captured. 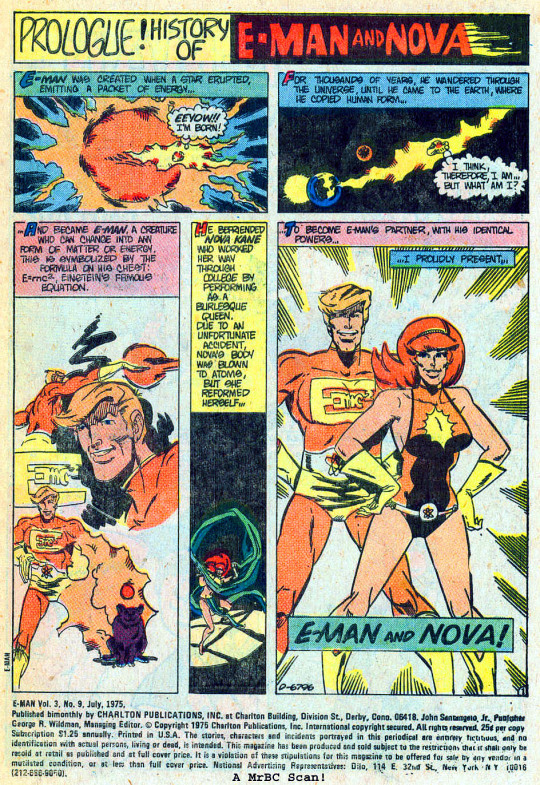 E-Man and Nova are taken before Genius One, who reveals that it’s consuming the strange likely-extraterrestrial plants that the found that gave both himself and the Professor their enhanced intellect. But the Professor wasn’t on board with conquering the world, and so he had to be put to rest. E-Man and Nova make a a break for freedom, along the way overloading the feeding mechanism for the plants, overfeeding them to death. Without the plants to power his intellect, Genius One is easily taken in by General Dove’s forces, having lost even his regular intellect along the way. 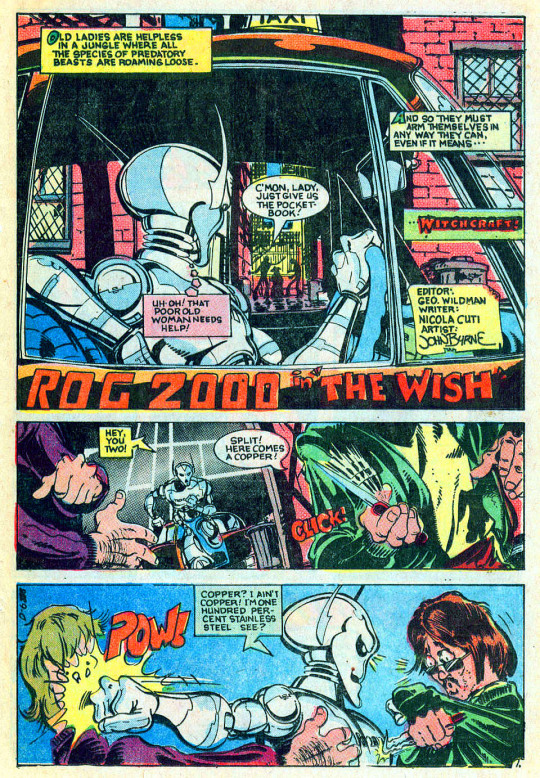 The back-ups in the later issues of E-MAN were devoted to Rog 2000, a creation of a young John Byrne that had migrated from being the mascot of a fanzine to the star of his own self-titled series. This is a pre-Marvel Byrne, when he was just starting out, and his artwork is unsure but still attractive. It’s natural cartoonyness making it very appealing. In this particular installment, the cab-driving Rog saves an old lady from a mugging, and it turns out that she’s a witch. As a reward, the witch makes Rog human–and the spitting image of a witness the mob wants rubbed out. So it’s a frantic chase until Rog stumbles over the witch-woman again and convinces her to put him back the way she found him–whereafter, he quickly punches out the mob hit-men with his metal fists. I really enjoyed this Rog 2000 story and was hungry for more.